LCE researchers play an important role in educational pathways. They contribute to the courses in the three university degrees of Aix-Marseille University (Bachelor, Master and PhD) through Faculty of Sciences, OSU Pythéas, a Doctoral School (ED 251) and a Distance Learning Center (CTES). The LCE welcomes trainees, PhD students, post-doctoral fellows and ATERs from these different university degrees but also from other universities and other French or foreign schools. 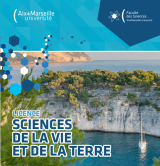 The life and earth sciences degree (licence SVT) is the main training for environmental and ecology ocupations at the Bachelor level at Aix-Marseille University. It offers to its students the best conditions to be major players in current and future environmental challenges. LCE researchers are strongly involved in the "Anthropogenic environment" course. This multidisciplinary course (geology, biology, chemistry, physics, mathematics and human sciences) makes students aware of environmental problems. The terrestrial environment master offers to students a high level multidisciplinary training in environment. Students are prepared for both research and management occupations in the natural and anthropogenic environments (agricultural, urban and industrial), mainly through the management of the various resources (water resources, mineral resources, alternative energy resources, soils, waste, biodiversity). LCE researchers are particularly involved in the Water Sciences (SC-EAU) and Environmental Management and Analysis (MAEVA) specialties. The Master of Engineering is a new way of access to the engineering professions, benefiting from ANR funding (IDEFI Program). Teachers and researchers from LCE are involved in this new training "Master of Environmental Engineering". The students selected to follow this training over 5 years will have access to the functions of engineers specialized in studies of the impacts of human activities on continental ecosystems and the development of tools for the management, preservation and remediation of polluted ecosystems. The aim of this new training course is to train executives who can work in environmental impact assessment offices, in companies involved in the treatment and/or analysis of water, soil, or atmosphere, in local/regional/national authorities and in major industrial and academic research organizations.